Easter Sunday was kind of boring and the weather was not very nice. Well it was rainy so it was nice, but not nice to go out and walk around lol! I decided to do some dyeing, One of my favorite books to use is Natural Dyeing , which I reference everytime that I want to use natural stuff to dye wool. I have so much roving to practice my spinning and I found it all boring. 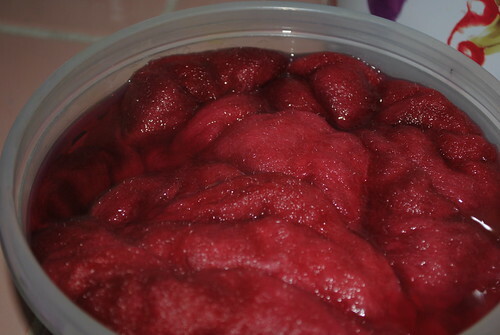 One of the things that you can do to make your yarn exciting is to dye it. I made these two batches the yellow with tumeric and the pinkish with beet juice. They are still wet and will be coming out of the drying in the next two days or si, they need to be fluff after being in hot water they get kind of matted and need to be caressed into shape. If I had a drum carder I would definitely card this again, it will make a big difference. Still I may give it a good Brushing lol! I hope you have a wonderful week and thanks for stopping by!